UNITED NATIONS, April 22 -- As Hamas and Fatah have bickered over electricity payments, many in Gaza have gone without lights. Not among these are the UN Relief and Works Agency, which has its own generators. Inner City Press asked UNRWA's John Ging about the power plant shutdown, who's to blame and what can be done. Video here, from Minute 36:15. Ging acknowledged that the dispute is between the "de facto government of Gaza and the Palestinian Authority in Ramallah," with the former recently agreeing to make payments to the latter. Fatah, as it happens, is accusing Hamas officials themselves of not paying their power bills. Truly, it is a power game. Inner City Press also asked Ging about on the one hand, executions carried out by Hamas, and on the other deaths killed by bombings by the Israel Defense Forces. Ging was cautious, referring to statistics on UN web sites and Hamas' rocket killing "a migrant worker on an Israeli kibbutz." He said that condemning executions is not within UNRWA's mandate, but that the wider UN system has condemned. It was at the end of Ging's press conference that spokesman Martin Nesirky called on Inner City Press, when Ging was going to leave. Inner City Press asked Ging about Canada's funding decision on UNRWA. "You ask the big questions right at the end," Ging said. He went out of his way to express appreciation to Canada, saying it has not decreased but only ear-marked its funding. But in the U.S. House of Representatives, an "UNRWA Humanitarian Accountability Act" has been introduced. Watch this site. Footnote: Recently the author Normal Finkelstein was invited by the UN Correspondents Association to give a talk at the UN. 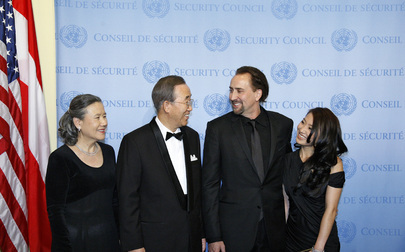 Inner City Press attended, and asked for Finkelstein's assessment of Ban Ki-moon's performance during Operation Cast Lead. The review was not positive. After the talk, the New Republic ran a review of not only Finkelstein but UNCA. [Ok, full disclosure of membership in UNCA and appearance in the New Republic piece.] The byline included that the author was an intern at the Inter Press Service, a media closely aligned with the generally pro Palestinian Group of 77 bloc. The affiliation led to some agita. Only at the UN. UNITED NATIONS, December 30 -- With hundreds of protesters outside the UN's building in Cairo, in New York the spin of Secretary General Ban Ki-moon's position(s) on the Egypt's construction of an underground wall to seal off Gaza gathered force. The Kuwait News Agency, KUNA, headlined an article on December 29, "Ban supports Egypt's decision to build steel wall along border with Gaza." Since the UN has repeatedly dodged questions about the wall, which Inner City Press asked in connection with the now-stalled Gaza Freedom March, this seemed surprising. 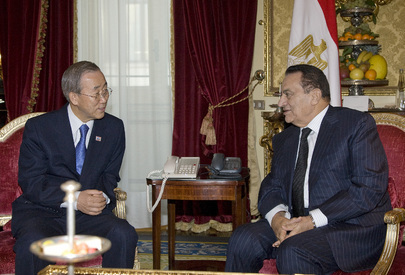 "UN Secretary-General Ban Ki-moon implicitly supports Egypt's decision to build a steel wall along its border with Egypt, meant to curb weapons smuggling into the Strip. 'We are aware of the media reports over recent days. It is our understanding that Egyptian efforts to counter illicit trafficking of arms and ammunition into the Gaza Strip, as all states are called upon to do by UN Security Council Resolution 1860, are ongoing,' his deputy spokesperson Marie Okabe told KUNA." Given the UN's refusal to answer Inner City Press' December 28 request for comment on Egyptian authorities' blocking press access to the protesters in front of the UN building in Cairo, on December 30 Inner City Press asked a narrower, more targeted question, "In light of the public report that Ban "supports Egypt's decision to build steel wall along border with Gaza," please clarify whether Ban in fact supports, implicitly or otherwise, the construction of this wall." The response repeats the quote used by KUNA, but amplifies it with an additional paragraph expressing concern for potential humanitarian consequences, see below. Regarding the reports about Egypt's construction activity, we would reiterate that it is our understanding that Egyptian efforts to counter illicit trafficking of arms and ammunition into the Gaza Strip, as all states are called upon to do by UN Security Council Resolution 1860, are ongoing. As for any potential humanitarian consequences, we continue to be gravely concerned about socio-economic conditions in Gaza. The key to a sustainable solution to the crisis in Gaza is for resolution 1860 to be implemented in full, including an end to the Israeli blockade and the reopening of all legitimate crossings between Gaza and Israel and Gaza and Egypt, as prescribed in the 2005 Agreement on Movement and Access. 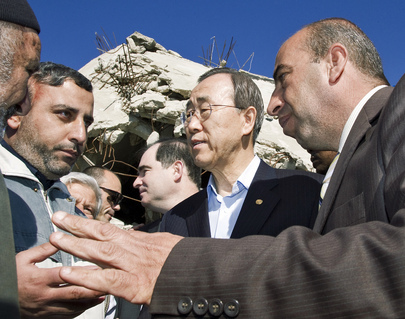 So does UN Secretary General Ban Ki-moon support Egypt's construction of the wall? Watch this site.